Despite its high stability, doubly magic nickel-78 is hard to prepare in the lab – adding neutrons to a nucleus is complicated. For this reason, physicists involved in both experiments decided to analysed nickel’s stable neighbour copper-79. This nucleus, prepared at the Riken laboratories in Japan, ‘can be described like a nickel-78 core with an added proton’, the authors explain. One of the teams used γ-ray spectroscopy to analyse copper-79, and compared their results to Monte Carlo computational calculations. Both experiments confirmed the structure of copper-79 nuclear orbitals hinting at the ‘magicity’ of its core, which is comparable to a nickel-78 nucleus. The other team analysed different copper isotopes with the most advanced mass spectrometry techniques, weighing the nuclei and correlating these results with their ground state energies. The mass spectra evidence confirms the accuracy of the previously calculated shell structure of the nickel-78 nucleus and demonstrate its doubly magic nature. 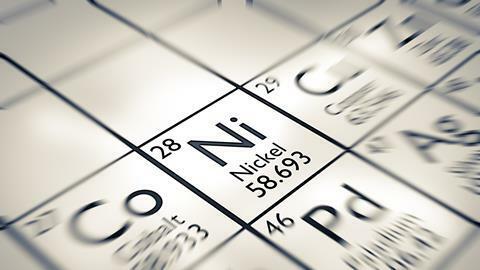 Both teams are now looking to the next step – directly exploring the magic properties of nickel-78. But this would require large quantities of this elusive isotope with a half-life of only 122 milliseconds. Hopefully, new high energy facilities will allow the production of this and other doubly magic nuclei in the near future. Am I the only person that has difficulty reconciling the following "Despite its high stability, doubly magic nickel-78" with "isotope with a half-life of only 122 milliseconds"